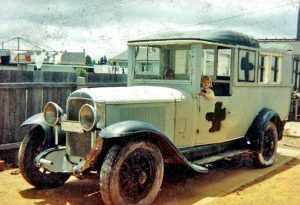 1929 – Buick Ambulance had a long and interesting working life. 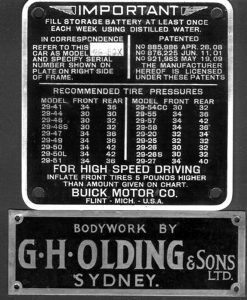 This big 1929 Silver Anniversary Buick served the NSW Government for many years, specifically the WC & IC (Water Conservation and Irrigation Commission). Purchased new in 1929 by the WC & IC, it was delivered as a model 29-50X seven passenger sedan. This would have been one of the 319 right hand drive vehicles Buick built for export and, with a list price of £795 in Australia, was quite a luxury car. The Buick was assigned into service at the WC & IC construction site of the Wyangala Dam* where its principle role was that of VIP officers car. Soon after, supposedly because of the remoteness of the site, a greater need for an ambulance vehicle became apparent and the Buick was dispatched to G.H. Olding & Sons Ltd in Sydney. As renowned specialist motor body builders, they removed the sedan body, replacing it with an ambulance body before returning it to service at the Wyangala Dam construction site. On completion of the Wyangala Dam* in 1935, the Buick was transferred to the WC & IC office at Mulwala on the Murray River, where it’s principle role was that of “Pay Car” during the construction of the vast irrigation system in the Murray Valley. 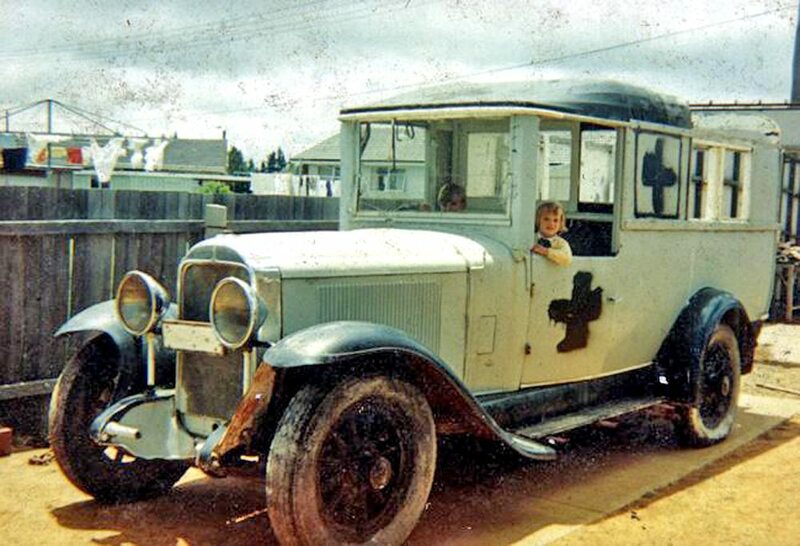 About late 1939 or early 1940, after the onset of the second World War, the Buick was transferred to Burrinjuck Dam** and again placed in service as an ambulance until about 1952 when it reverted back to pay car duties before retirement in 1954 when it was sold for £40 to a local for private motoring. It remained in the Burrinjuck area where it served the owner at weekends and for extensive holiday travel for several years, reportedly without any problems. 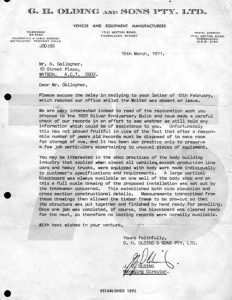 In a letter written in 1971, this owner recalled that the Buick would run on kerosene after starting and warm-up on petrol. This was a common practice during petrol rationing in the 1940’s. 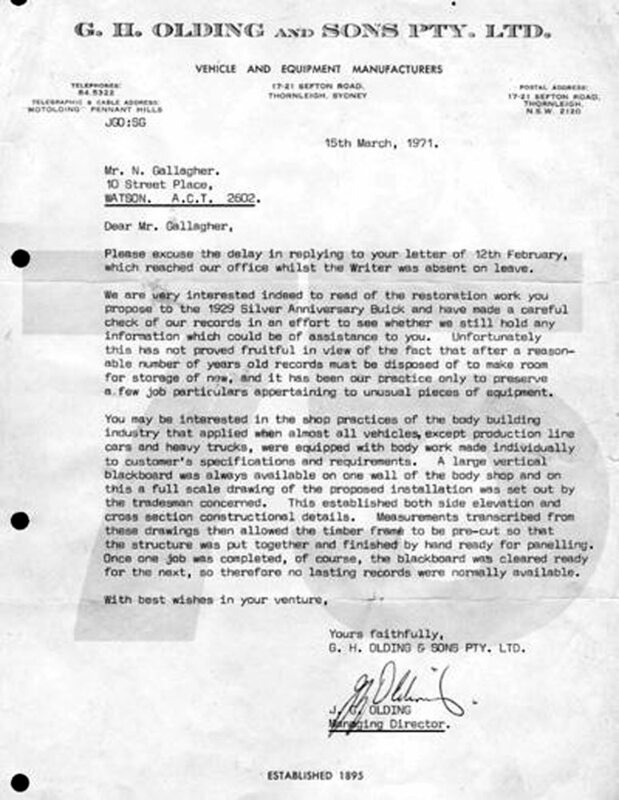 His letter also recalls that the Buick had been fitted with a charcoal burning, gas producer during this period. In 1959 the Buick was again sold and moved to Nth. Yass, then on to Canberra and later to the Campbelltown area on the outskirts of Sydney. The second picture below, shows the firewall identification plates that have survived from the original ambulance. 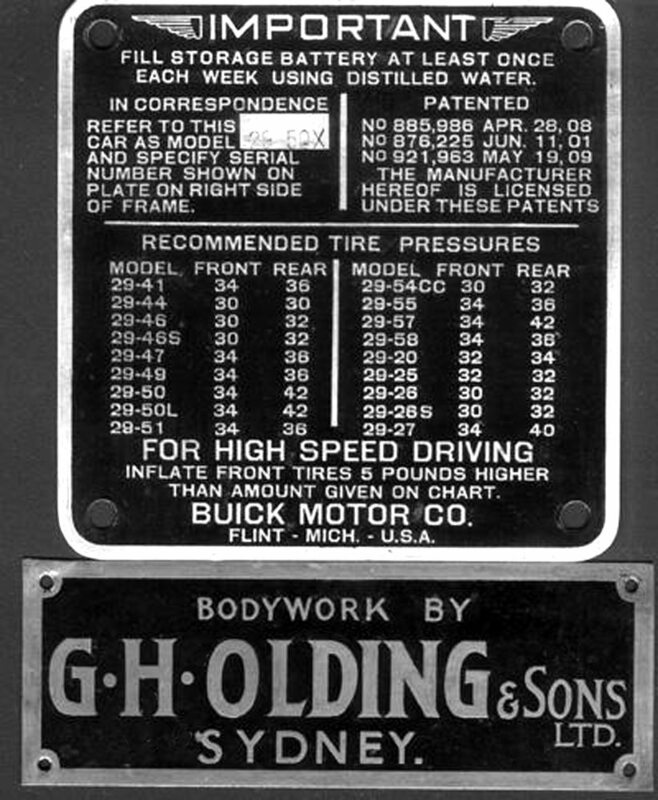 Note the hand stamped model identification “29-50X”. The photo above, circa 1971, was taken prior to the Buick being dismantled ready for restoration. Regretfully the planned restoration did not proceed and the ambulance bodywork did not survive the ravages of time but much of the mechanicals did survive. Colin Castle acquired the mechanical remains for use in the restoration of his 1929 Buick Master Six roadster. WC & IC’s mechanical maintenance had been kind to the Buick and the engine, showing little sign of wear, today in 2003, is in service again powering Colin’s roadster. *Construction of the Wyangala Dam, situated at the junction of the Lachlan and Abercrombie rivers, commenced in 1928 and was completed in 1935. **Construction of the Burrinjuck Dam, situated in the upper catchment area of the Murrumbidgee River, commenced in 1907 but due to delays caused by shortages of labour and materials during World War 1, it took 20 years to build. During a massive flood in 1925 water more than a metre deep, poured over the main wall, consequently the spillway height and dam capacity was increased with work commencing in the 1930’s and finally completed in 1956.